The character of New England wouldn’t be quite the same without the countless miles of stone walls that criss-cross the forests and weave through modern suburban sprawl. It’s not uncommon to find these walls running straight through the woods, which leaves many people wondering exactly why they were built in the first place. The answer is simple: wherever you find an old stone wall, you can rest assured that the area in which you stand was once almost entirely clear-cut. Stone walls could potentially serve a variety of purposes: they sub-divided farmland, kept livestock out of crops or served as property boundaries. But the choice of stone as building material didn’t arise out of any sentimental appreciation for rock… it was borne of necessity. As farmers clear-cut more and more land throughout the Northeastern United States, the bare ground became more susceptible to erosion and deep-freezing. In turn, millions of tons of glacial rubble slowly became exposed on the surface of the Earth, revealing “magical crops” of stone that seemed to appear anew each year. The stone had to go somewhere, and building stone walls was the most practical solution. In fact, most stone walls weren’t exactly all that effective as a “proper” wall; they could only be built a few feet high at the most before they would simply crumble. The majority weren’t even constructed with nearly as much attention to detail as we might imagine, often being stacked only carefully enough to minimize the amount of space that the “agricultural waste” would occupy. Most people didn’t give them a second thought in the early to mid-1800’s… they were about as ordinary and uninteresting at that time as sidewalks or telephone poles are today. Only after the agricultural way of life mostly vanished in New England did people begin to think of these relics as something of interest. On a side note, while stone walls generally are thought of as a New England icon, they can be found all over the Northeastern United States. The photograph above, for example, was taken at Mianus River Gorge Preserve in Bedford, New York. 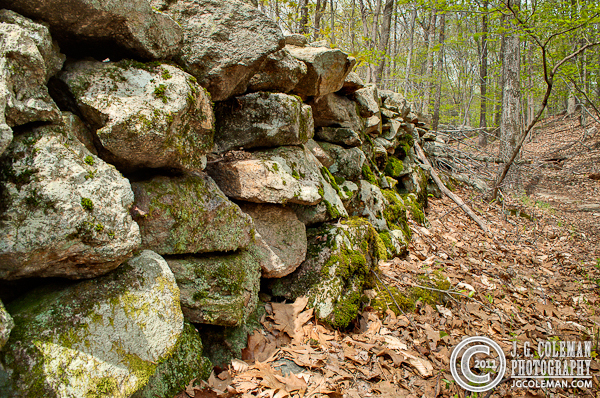 Photograph of Stone Wall © 2011 J.G. Coleman Photography. View more photography by Trails of Freedom Chief Researcher, Justin Coleman, at J. G. Coleman Photography.